Sookie does her best to rescue those in Fangtasia, while the vampire bar itself gets an origin story. Holy quality jump Batman! From the very start of this episode, I had a feeling that we were in for a great one. There are a lot of things “Death is Not the End” brought to surface here, so let’s get into it shall we. The episode opened the right way. 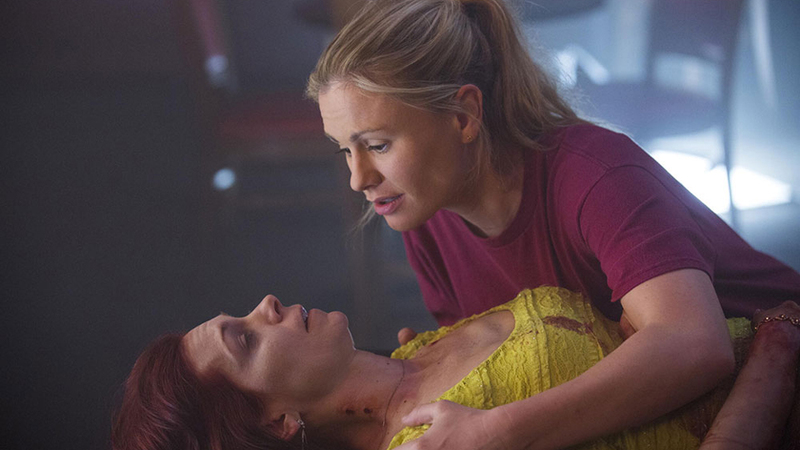 In normal True Blood fashion, we would have started with Sookie still mourning over Alcide’s dead body. Instead we were given a dual of saddened phone conversations with both Stackhouses delivering bad news to a family member of the dearly departed. Sookie delivered the news to Alcide’s Father Jackson, a face we haven’t seen since last season, and Jason had to give a call to Hoyt and inform him of his mother’s death. It was not only nice seeing two old characters have a brief appearance, but that the events of last week weren’t just mindless deaths that would be rapidly clouded by new events. I hate flashbacks. Not only in True Blood but in any show really. I gave a figurative eye roll when another one started this week, but I quickly realized that was unnecessary. The flashbacks were actually enjoyable and Pam offered her humor to elevate things even more. “Excuse me? Did we f*** and I blocked it out?” Classic Pam. The flashbacks took place in 1996, where we got the Magister, another returning face, handing over a movie store to new Sheriff Eric Northman and Pam. We also got to see how Ginger got into the mix and the birth of the idea that is Fangtasia. I was actually excited to see the flashbacks return as they were dispersed throughout the episode, and I found it touching seeing Eric and Pam bond. We also got the Eric we are used to back this week, albeit he’s pretty weak given he’s an H-vamp. One scene I loved this week was seeing everyone gathered at Bill’s house. This was very reminiscent of Season 3 when everyone eventually congregated at Russell Edgington’s estate. Lafayette even showed up, and with an uppity attitude that we haven’t seen since the early seasons of the show. Turns out Jessica couldn’t heal because she was starving herself due to the heavy conscience brought on by her killing Adilyn’s fairy sisters. James also got a small scene, but seeing that he’s Jessica’s boyfriend it’s odd that this is our first time seeing him with her. Eric and Pam (in modern time) arrived at Bill’s house followed by Willa, making this all one big happy reunion. Oh, and Keith, who comes into play later. Sookie was watchable this week, giving honest commentary on her own life and decisions. Her talk with Arlene’s kids proved to be the kick off for an emotional ending hook. Sookie actually did more good than harm this week as well. She helped Holly remember where Arlene and the others were being held captive, and she got Jessica to agree to aid in the rescue mission, all for the sake of getting s*** done. Everything leading up to the Fangtasia rescue mission was just done so well. Unlike many episodes, everything had a purpose here. After everyone rallied together, it was time to take on the rest of the H-vamps at the former movie store. Things were pretty intense here. This episode actually felt like a mini season finale. Being as this is the final season, I felt anything could happen here, keeping me on edge with the fear that any character might die. Arlene got really close, close enough to see her departed husband Terry. The fact that Sookie promised her kids that she would find their mother and bring her back made this scene rather impactful emotionally with Anna Paquin delivering a great performance. Arlene has new vampire Keith to thank, who is sure to be a new love interest. All ended well with all the H-vamps dead (excluding Eric). 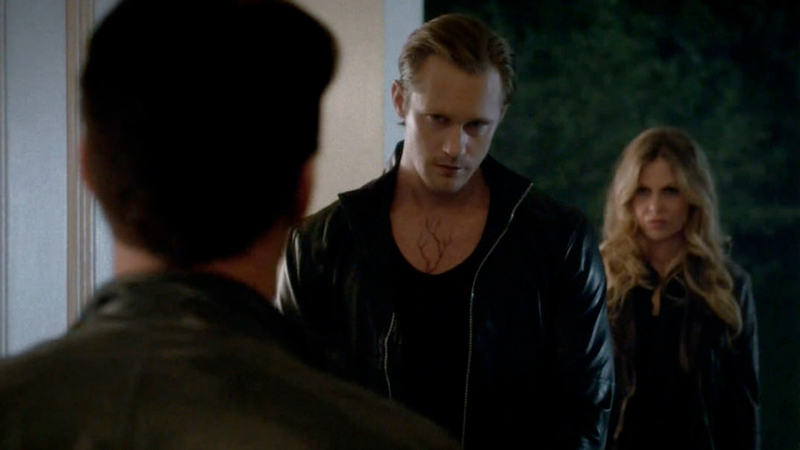 This statement may not hit hard but “Death is Not the End” is one of the best episodes of True Blood is recent memory. From beginning to end, it had a down to earth feel, with characters facing believeable obstacles. It was structured well enough that the pace ramped up at the right time. The rescue of those left in Fangtasia was a heart pounding one, leaving the focus to presumably fall on Sarah Newlin and the Yakanomo/Yakuza gang. I’m just hoping the show can keep this type of quality throughout the rest of the season. How did you like this episode? What was going through your mind during the rescue? Let us know in the comments below.